How wonderful to pray for the salvation of souls and know we are praying in the Father’s will! It is His desire that all come to repentance. How thankful we are for this amazing truth! Recently we experienced a blessing we wanted to share. Melody received a note on Facebook from a lady saying they were in town and would like to see us. Annie and her husband, Angel, with their four children had moved away from Arica over seven years ago. The children had attended our Sunday School. We remember our daughter Becky faithfully going to their apartment on Sunday mornings to pick them up. Sometimes she’d even have to wake them up and then wait for them to quickly get ready! The day they were moving they came over to say good-bye. We still remember their little daughter, about two, crying andyelling, “I don’t want to go!” We were very sad when they moved, yet put them on our prayer list and prayed for them. Since then there has been little contact, and so it was a nice surprise when they wanted to make a short visit with us. As we sat talking, we felt that God was working in their lives and they were seeking Him. Angel is a police detective and lately had been having panic attacks and depression fromstress. We gave them a book (in Spanish) called Done by Cary Schmidt; it’s a very clear presentation of the gospel, stressing that there is nothing we can “do” (as most religions teach you must) to be saved, but that it is already “done” by Christ when He died in our place on the cross. They promised to come to church on Sunday night, and they did! Again, we were able to talk with them. They said they had been reading the book Done, and doing some serious talking. Jim gave Angel and the two oldest daughters Bibles. Angel was very touched and said he had never been given a Bible before and promised to read it with his family. It was exciting to see how the Lord had been working. Angel said when he was in a moment of crisis he called an old friend and co-worker. The co-worker became a Christian last year and told Angel, “It’s really true, man, if you don’t have Christ, you don’t have anything!” This really impressed Angel as his co-worker had been a well-known, wild “partier” before. We ask prayer for the Parraguez family. They went back to their home but Melody received a note from Annie yesterday saying that Angel was “enthusiastically” reading his Bible and wanted to know the best way to read it. We are thankful that we can depend on the Lord to continue working in their hearts to bring them to salvation. We thank the Lord for His help with our Christmas activities! Of course, December is always a busy month! We had the great blessing of having Jeremy with us all month! 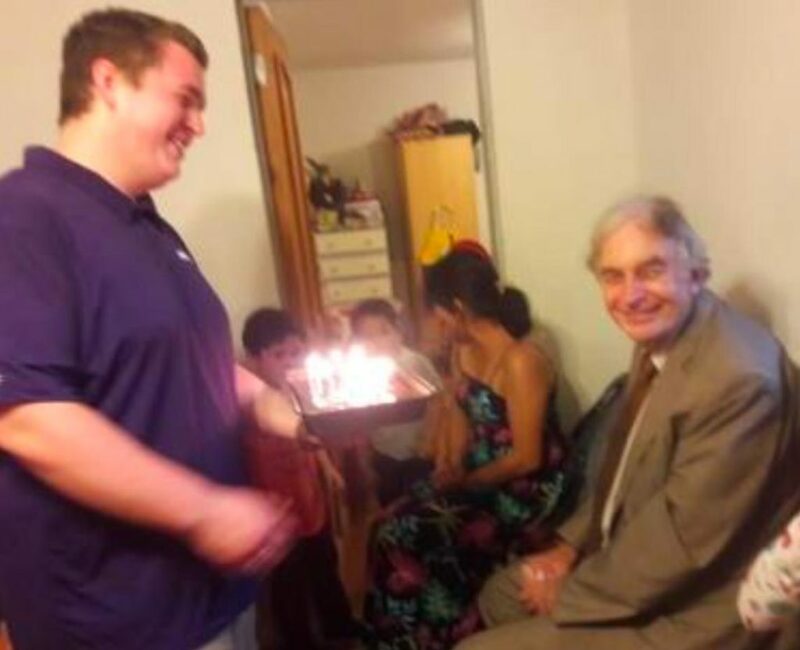 He arrived to surprise his dad on Jim’s 60th birthday. We had a special celebration for Jim at church and then Jeremy walked in to make it extra special! He was such a blessing while here, helping at church, giving a youth theme, singing in the Christmas program, etc. Debbie was so happy to have her brother here. 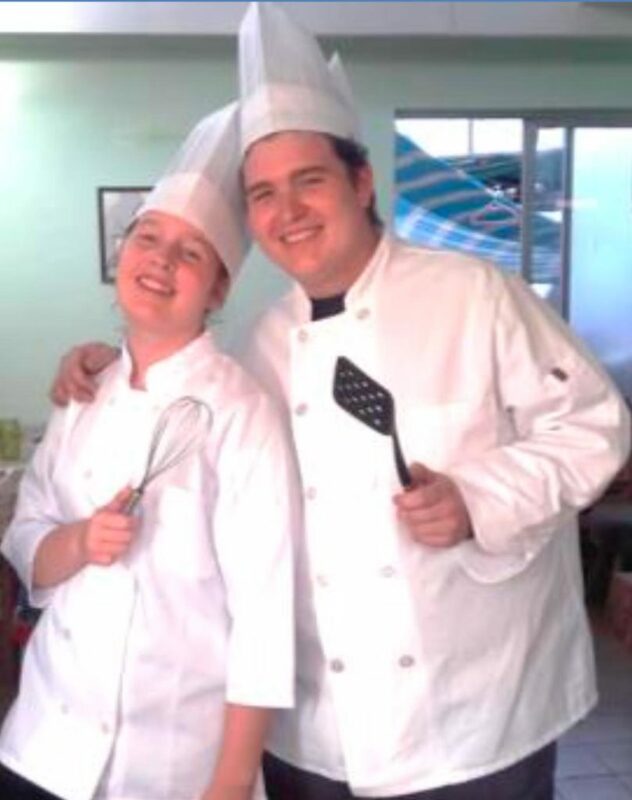 They worked together to make us a special dinner for our wedding anniversary, too! We are so thankful for God’s goodness. Melody held a Christmas evangelistic tea for the ladies. The church ladies were encouraged to invite two unsaved friends. We had 14 visitors who came and heard the gospel! Such a blessing! We also thank the Lord for the 14 or 15 visitors we had at the Christmas program! One lady in our church has been inviting her Roman Catholic parents for years – and this time they came. 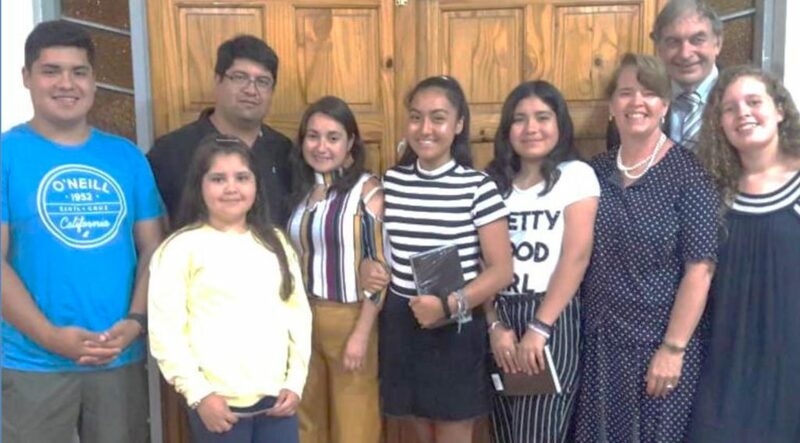 We are thankful that two of our young people traveled on a mission team with seven others to La Paz, Bolivia, in early January, where they helped in a VBS program, passed out many Gospel tracts, visited in people’s homes, and helped in the church of Pastor David Quisbert. It’s wonderful to see their desire to serve the Lord. January and February are “vacation” months. Many of our people are gone for several weeks during our summer, but we do have traveling visitors from Peru and Bolivia, as well as Chile, come through, too. Please pray for our people to be faithful during the summer months! It is quite hot and the beach is very tempting! Please pray for our upcoming activities. February will be busy. Melody and Debbie will be traveling to Lima, Peru on February 4th as Debbie attends her first Missionary Kids camp. She is excited! They will be returning with Melody’s niece, Jocelyn Smith (who will be meeting up with them in Lima), on February 12th. Jocelyn will be staying with us for two and a half months. She wants to help in the work here and become more fluent in Spanish. Please pray for our summer VBS starting on February 19th. We are working on the materials now. Prayer is needed to complete all the work, and for the children who will come. We pray the VBS will be a boost to our Sunday School, as attendance has been down. We are so thankful to you who support us and pray for us. Some of you have told us you pray for us every day. What a priceless blessing! We ask that you continue to pray for us. + Please pray for our spiritual needs – our desire is to grow to be more and more like Christ. + Please pray for our children and their spiritual needs as well. + Please pray for our physical needs. We are not as young as we once were; our energies often fail and it takes longer to get things done! We want to be able to minister to others but we canonly do it through the Lord’s strength and enabling. + Please pray for wisdom and leading about Jim’swrist. After finishing therapy last year, the doctor looked at the last ex-ray and said that Jim would need yet another operation to fix the bones. Also, the titanium plate that was put in should come out. While we do not want to have to go through all that another operation entails, it seems as though that is the only option if he wants to get full movement in his wrist and hand. + Please pray for wisdom as we pray about the possibility of a short furlough at the end of the year. There are many things to be taken care of here as well as there for it to happen. We’d like to share a little poem that Jim recently wrote. We hope it will be a blessing. When the five thousand all had dined, The fragments were not tossed.Not one was to be left behind; Christ’s will is that none be lost. The waters of the sea God restrained ‘Till all reached the other shore.When all had crossed and none remained, The waters flowed as they had before. Christ will faithfully keep His own; In presence He is always nigh; We are never truly alone; We are the apple of His eye. Those who to heaven have already departed, Their bodies in the grave won’t stay; Christ will finish what He started; They shall rise on that rapture day. Christ will come soon for His own; For when a Christian dies,His body’s not buried, it is sown; The dead in Christ shall rise. Not a sparrow from the sky can fall, Nor a star in the heavens fail, Except by the will of God who is over all; By His might we shall prevail. He will seek His one lost sheep; Precious to Christ is each one. He will forever His child keep; Forsaken by Him, there is none. When a brother falls on life’s track; May I lead him to Your grace And help him in what he might lack, To finish well his race. Help me, Lord, to be more bold, And more relentless to pray, For the many not yet in Your fold, Who are lost and gone astray. May my theme be “that none be lost,” For that is the Father’s will.Help me win others, whatever the cost, And strive your heaven to fill. 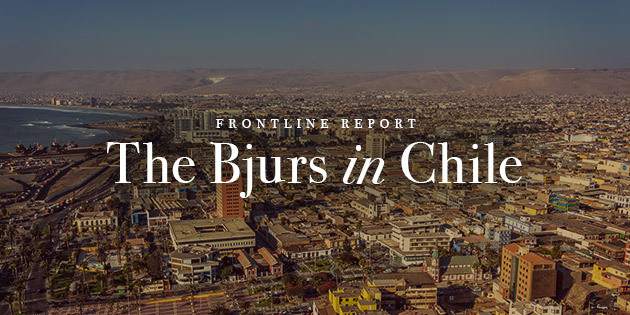 Again we thank you for your prayers as it is only by God’s grace that we can continue to work and serve Him here in Arica.